Southampton City Council is proposing a city-wide Clean Air Zone (CAZ), which could charge certain commercial vehicles up to £100-a-day to enter. 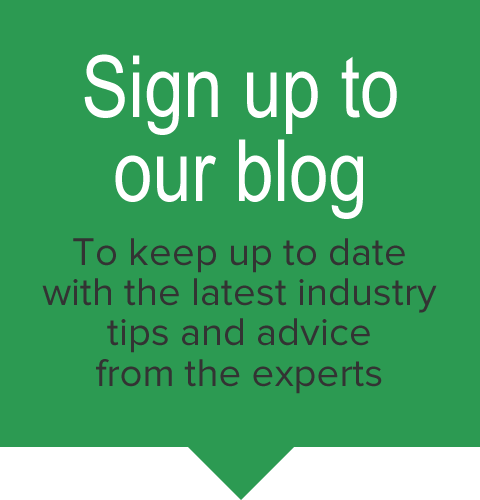 In this blog, we look into the plans in more detail, why they are being implemented, how will this affect local businesses - and more importantly how businesses can best prepare to avoid the charges and stay compliant. Why does Southampton needs a Clean Air Zone? The city council has been order by central government to reduce its nitrogen dioxide amount to the EU-imposed level of below 40 micrograms per cubic air metre by 2022. The current levels in Southampton are 42 micrograms. Southampton was one of five city authorities mandated within the government’s 2015 air quality plan as being required to establish a Clean Air Zone by 2020 to help bring these levels down in order to provide a healthier and safer environment. The other four cities include Birmingham, Derby, Leeds and Nottingham. What are the Southampton Clean Air Zone plans? Under the proposals, buses, coaches, taxis (Hackney carriage and private hire) and heavy goods vehicles (HGVs) would be charged to enter the Clean Air Zone should the vehicle fail to meet minimum emission standards (Euro 4 petrol/Euro 6 diesel/Euro VI diesel). The preferred option would not charge any private vehicles, light goods vehicles (LGVs), minibuses, motorcycles or mopeds. *Please note the charging rates are subject to further review and assessment. To recap: non-compliant HGVs, buses and coaches (Euro I-V) will be charged a daily fee of £100 for driving within the confines of the zone. While non-compliant taxis and private hire vehicles (Petrol: Euro 1-3 and Diesel: Euro 1-5) will incur a £12.50 charge each day. However, private cars, minibuses, light goods vehicles, motorcycles and mopeds are compliant and so will not be charged to enter the zones. Unsure what Euro class your vehicle is? 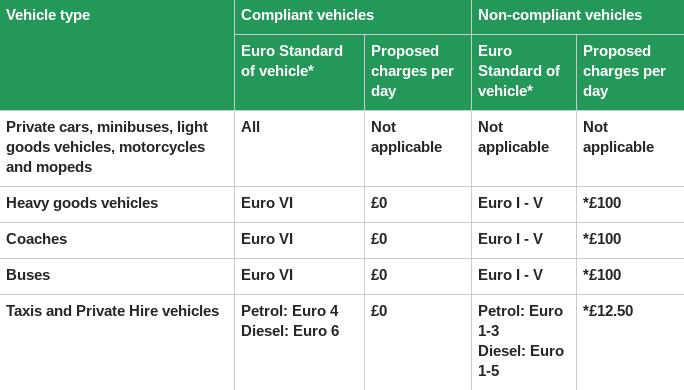 The two tables below shows the different Euro categories that apply to all new petrol and diesel vehicles. As always, for a definite evaluation of which Euro-standard any engine is, we’d advise contacting the manufacturer. *Some Euro V vehicles still registered from 1 September 2015 – 1 September 2016. All new registrations from 1 September 2016 are Euro VI. Banning diesel vehicles could be the easiest way for cities to achieve air quality compliance in the shortest time, but punishing the fuel too quickly could halt the development of alternatives. We anticipate that HGV vehicle operators will be the most impacted by the CAZs as vehicle upgrades will be less affordable. This is particularly problematic for small business owners who tend to own older vehicles, and are unable to offset the costs of the upgrade. It’s also estimated that particular sectors will be hit harder than others, such as construction sector, where a competitive market will make it more difficult to pass on costs. The plans could also open the door to wider road-pricing schemes to tackle air pollution and congestion, although the government has stressed it wants to see local authorities explore all other measures before introducing new charging schemes. As part of the Clean Air Zone framework, local authorities are expected work with local businesses to explain the aims of a zone and encourage the uptake of programmes to address air quality. In the meantime, businesses should be making plans now to ensure their fleet is as green as possible to stay compliant and avoid the upcoming charges. 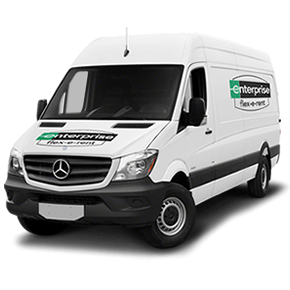 One of the biggest considerations many fleets are now facing is weighing up the costs of retrofitting, purchasing or hiring new, compliant vehicles. Clean Air Zone plans and emission standards are just some of the issues affecting urban fleet operations. With this in mind, we know that making vehicle purchasing decisions for your business in the current climate is no easy feat. That’s why we’ve put together this handy guide on choosing the right vehicle option for your company. Download it for free below.